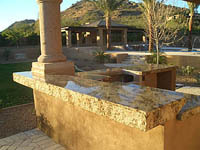 Granite, Quartz, Marble & Other Counter Tops in Phoenix, Scottsdale, Chandler, Mesa and The Valley Of The Sun. FREE In-Home Estimates For Counter Tops. Call Bill Werner today for an immediate appointment 480 292-0975. Imagine how you will feel walking into your kitchen and seeing it outfitted in beautiful natural stone countertops. The first time, and every time you see stone countertops, they will always be breathtaking. Our exceptional craftsmen will transform your kitchen into a showroom for your friends and family to enjoy for many years to come. Enhance the value of your Phoenix area home by replacing your existing countertops today with the bold, beautiful look of granite, quartz, or marble. My name is Bill Werner and it would be my pleasure to assist you with all your countertop needs. I can coordinate the fabrication of just about anything that you would like to have built from stone slab material. Our fabricators can create breathtaking fireplace mantles and hearths, barbecue island bar tops, pony wall and niche caps, bath tub caps and surrounds for any shape tub, shower surrounds, table tops, and many other possibilities. We have assisted hundreds of Arizona families with their stone countertops and I would appreciate the opportunity to show you why we have such a high customer satisfaction rating. Enjoy looking around our website for information about all types of counter top materials. Please feel to call me with any questions you may have. My direct line is 480 292-0975. Every Arizona home is unique and I would appreciate the opportunity to assist you in choosing the ideal countertop solution for your home. 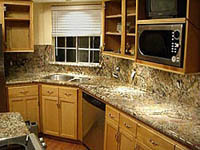 Also see our section about outdoor granite countertops. Call us for countertops in Phoenix, Scottsdale, Chandler, Mesa, Gilbert, Goodyear, Glendale, Anthem and throughout the Valley of the Sun. For roof repair, contact The Roof Medic at 817 471-5554.